By Don Hammonds Want something to talk about? Take a look at Lexus' all-new UX, its smallest--and most affordable way of putting Toyota's luxury brand in your driveway. It has a wild look to it that, for some reason, makes me think of the Minecraft stuff that my kid has in his room. Yes, it's that wild looking! But you know, as startling as it is, you really grow to love it. I happen to like it a lot, but for most people, it has to grow on you. It looks like a piece of automotive Origami, and I say thank heavens. I like the unique, the different, the polarizing. So much of what we have in dealership showrooms these days looks like everything else. And getting behind the wheel is areal treat. A nice, fat steering wheel introduces you to a strong handling, quick driving small SUV, which in itself is a rarity. It holds the corners beautifully, and there's absolutely no trace of body lean or overly sensitive brakes, either. Our tester was a silver 2019 UX 250h F Sport, which is the top of the line --and the sportiest of the UX models. It is powered by a 2.0 liter four cylinder hybrid engine, an element that is part of a hybrid electric system that produces 181 total system horsepower, backed by a continuously variable automatic transmission. The other elements are two motor generators and an electric motor that drives the rear wheels when it is necessary, and a nickel-metal-hydride battery pack. With this system, the UX has a 39 mile per gallon rating for combined city/highway driving, along with ratings of 41 city and 38 highway. You save $2,000 in fuel costs over five years, and you use only 2.6 gallons to travel 100 miles. Annual fuel cost is $1,000, based on 15,000 miles of driving per year at $2.55 a gallon, and your gasoline expenditure is around $7,000 over a five year period. Another UX model,.the UX 200, is powered by a new 168 horsepower, 2.0 liter four cylinder engine paired with that CVT transmission. Interestingly, according to Consumer Reports, Lexus is using something called predictive software with the UX 250h hybrid, to help drivers get the best fuel economy they can get. the magazine's "New Cars" issue says, "The Predictive Efficient Drive analyzers driving habits to optimize the hybrid battery use, the Predictive Deceleration Support collects GPS data on where drivers have slowed down or baked in the past and increase regenerative braking accordingly, and predictive State of Charge uses the navigation system to predict when the battery should charge." As you probably know, the SUV/CUV market is busting wide open. Sales are off the charts, and for the smallest models, the blazing sales are red hot. No wonder Lexus wanted all in! And they didn't have anything in their lineup that could come close t6o the smallest segment of market--so--enter the UX. But just because its small doesn't mean it lacks Lexus clout and charisma. The utter quiet inside, the quality of the materials, the embracement of Lexus' new design language, and the wealth of high tech features shout Lexus loud and clear. Getting inside the UX is quite an experience. As you sit down in those comfy, soft but firmly supportive front seats, you notice an instrumental design that looks like it came from the 22nd century. Don't look for numbers arrayed across a instrument panel to inform you of you r speed, Instead you'll see a circular dial that tells you the speed, surrounded by fluid lines that tell you when you and the engine are accelerating for more power for instance. Some controls are located in round dials attached to hood of the instrument gauge, and you have tabs to lift or lower when you want to adjust or turn off some climate systems, for instance. It's all pretty cool looking, along with the rakish, minimalist layout and design of the door inserts. The glove box lid opens sideways, not up. A small point: This is one of the only cars I've gotten in where the armrest/lid over the console actually is long enough to really support your arm and elbow. But the interior also is the place where you will find what I think is Lexus' most annoying and unintuitive feature: the Infotainment system. there's a flat pad that use to guide the controls, but you do so with jarring, irritating finger action that you slide across its surface. You can find yourself trying to get to one process and you find that you've intruded upon another. And that's pretty dangerous for people who insist on making adjustments while driving--which you should never, ever do with this particular system. One accidental nudge, or one use of a pudgy finger and you can be in real trouble. You can spend precious moments before driving off, just sitting in your car just trying to get the damn thing to settle down and just go to where you want it to go on the large screen that graces the dashboard. Four words: Lexus. Change this. Now. 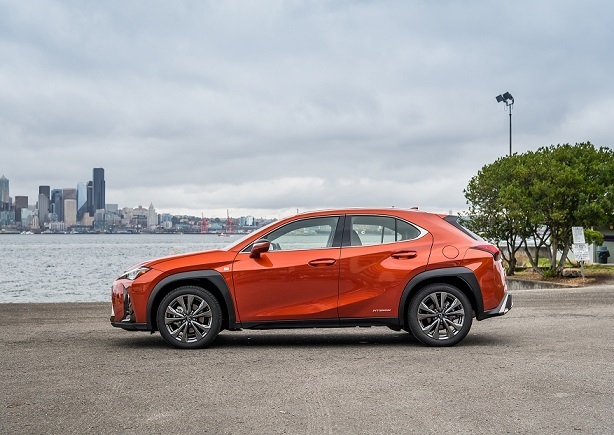 The 2019 Lexus UX 250h is a five-passenger SUV that comes in base and F Sport alternatives. It uses a 2.0-liter four-cylinder engine, two motor-generators and a nickel-metal hydride battery pack. This setup provides a total of 181 horsepower and drives the front wheels through a continuously variable automatic transmission. A third electric motor is used to power the rear wheels when extra traction is needed. All wheel drive is available, from what I've read. So what do you get for no extra cost? 18-inch wheels, LED headlights, heated side mirrors, proximity entry and push-button start, selectable drive modes, dual-zone automatic climate control, simulated-leather upholstery, power-adjustable front seats, and a 60/40-split folding rear seat. You also get a rearview camera, Bluetooth, an infotainment system with 7-inch touchscreen display, smartphone app-based navigation, onboard Wi-Fi, four USB ports, Apple CarPlay smartphone integration, six-speaker audio system, and satellite radio. Among the standard safety features are the Lexus Safety System 2.0, which is comprised of driver assistance features such as forward collision warning, automatic emergency braking, adaptive cruise control, lane keeping assist, road sign recognition, and Lexus Enform Safety Connect emergency services. There are a couple of packages available for the base model UX 200, too that are extra cost. They include a the Premium package, heated and ventilated front seats, a sunroof, automatic wipers and what is called "washi" interior trim that calls to mind a kind of Japanese fabric paper. Another optional package is called the Luxury Package, which adds to the Premium package the following: sound-damping front side windows, auto-dimming side mirrors, a hands-free power liftgate, driver-seat memory functions, blind-spot monitoring, a navigation system, a 10.3-inch central display, and an eight-speaker sound system. Another optional package is the F Sport performance group. which provides a unique to the F Sport package 18 inch wheels, sport tuned suspension, LED foglights, an augmented engine sound generator, steering wheel paddle shifters, sport front seats, and an upgraded digital gauge cluster. Some options that are available but are not part of a package include upgraded triple-beam LED headlights, a sunroof, a windshield wiper de-icer, an auto-dimming rearview mirror, and a heated steering wheel. Tech upgrades include parking sensors with low-speed auto braking, a head-up display and a wireless phone charger. The warranty package includes a four year/50,000 mile basic coverage, six year/70,000 mile powertrain coverage, eight year/100,000 mile hybrid battery/hybrid warranty. Overall, I really enjoyed the uniqueness, flair, and ground-breaking design of Lexus' fun-to-driveUX 250h F Sport.